San Diego County has more small farms (over 6,500) than any other county in the Country. With spring just around the corner, San Diego’s Farmers Markets are a great way to enjoy the bounty of fresh fruits and vegetables. My favorites are the Little Italy Mercato on Saturdays and the Hillcrest Farmers Market on Sundays. But with over 45 farmers markets in the County, you’re sure to find one wherever you are. 2. The American Comedy Co. This weekend, The American Comedy Company opens in the Gaslamp Quarter and will feature San Diego native Bobby Lee. Lee has performed stand-up on “Late Friday,” “Premium Blend” and “The Tonight Show.” Shows are Thursday and Sunday at 8:00 pm and Friday and Saturday at 8:00 pm and 10:00 pm. 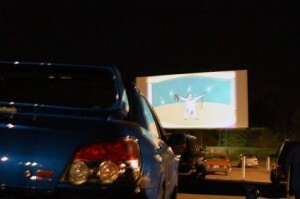 Go old school and check out Santee’s Drive-In Theatre. Admission is $8 for adults and $4 for kids. Children 4 and under get in free. This weekend, The Lorax debuts on March 2nd. Other movies currently playing include Act of Valor and Ghost Rider. This weekend, the San Diego Junior Theatre located in Balboa Park debuts the Musical Adventures of Flat Stanley. Stanley Lambchop is your ordinary, every day, run-of-the-mill ten-year-old: normal mom and dad, normal little brother, normal life. One night, the bulletin board on the wall above Stanley’s bed comes loose and falls – right on top of Stanley! The next morning, Stanley Lambchop wakes up flat! Performances are Fridays at 7:00 pm and Saturdays at 2:00 pm. It’s that time of year again, when the flowers start blooming in the Anza-Borrego Desert State Park. One of the nation’s largest state parks, the 600,000-acre Anza-Borrego Desert is within a two-hour scenic drive from downtown San Diego and offers visitors endless opportunities to experience the wonders of the desert. Be sure to call the hotline for the latest on the desert blooms. 760-767-4684. This entry was posted in Arts & Culture, Attractions, Insider Tips, Outdoor Adventures, San Diego Events, Tours & Sightseeing and tagged balboa park, downtown, east county, farmers markets, Gaslamp Quarter, Hillcrest, little italy by Suzzanne. Bookmark the permalink. I haven’t heard how goo the desert bloom is this year. Some years are better than others. When the desert is in bloom the sight is breathtaking. Farmers market, comedy and Wildflowers …sounds like MY kind a weekend! !